Here we have a great selection of Medieval collectibles and gifts for all ages. All of our medieval collectibles and gifts are great for decorating your home, office or used as stage props. These collectibles and gifts are made of quality materials and very affordable. Whether you are re-doing an entire room or just looking for a few unique Medieval style Home Decor pieces, you're in the right spot! We have a great selection to choose from. Our 1 Liter Oak Barrel with Black Steel Hoops is perfect for the Full Time Reenactor who likes to do things the old way. These barrels are handcrafted from American White Oak and have black steel hoops. Our 2 Liter Oak Barrel with Black Steel Hoops is perfect for the Full Time Re-enactor who likes to do things the old way. These barrels are handcrafted from American White Oak and have black steel hoops. Our 3 Liter Oak Barrel with Black Steel Hoops is perfect for the Full Time Reenactor who likes to do things the old way. These barrels are handcrafted from American White Oak and have black steel hoops. Our 5 Liter Oak Barrel with Black Steel Hoops is perfect for the Full Time Reenactor who likes to do things the old way. These barrels are handcrafted from American White Oak and have black steel hoops. The Alchemy Tarot Card Set is a deck to divine your spiritual path through the esoteric wisdom of the Tarot. A fully illuminated oracle of classic Alchemy imagery. With 78 uniquely different images. Our Bicycle Alchemy Poker Deck is something you will want to hold and admire each and every one! This full deck contains all four suites and all denominations. Our Miniature America Liberty Letter Opener is made by Marto of Toledo Spain, created in memory of the 9/11 Twin Towers disaster and terrorist attacks of September 11th, 2001. Our Apocalypse Riders Letter Opener is made by Marto of Toledo Spain. Our Attila the Hun Letter Opener is made by Marto of Toledo Spain. Our Arabian Scimitar Cutlass Letter Opener by Marto from the persian word shamshir - lion's tail, is the Arabian/Moorish version of the Cutlass. Our Anchor Mount Ship's Bell is a polished brass bell that has a rich tone when struck. Hand-crafted in solid brass, it comes with a bulkhead / wall mount bracket that allows it to be easily removed from the bracket and stored when not in use. This Crusader Banner is a Historical Medieval Banner from the Crusader period, Blue, Yellow, White. Sewn from linen these quality banners are not silk screened. Our Barbarian Letter Opener depicts a winged two-headed dragon. In a world where strength was the law, Barbarian swords were robust and powerful, a symbol of authority and respect. Our Charles V Letter Opener honors Carlos V, ruler of the Holy Roman Empire from 1519 and, as Charles I of Spain, of the Spanish realms from 1516 until his abdication in 1556. Our Catholic Kings Letter Opener by Marto is one of the most spectacular swords in Spanish History. This Crusader Knights Mini Shield is crafted in wood and features the Templar cross emblazoned on the front in vibrant red, while the shield itself features a white field (or background) that serves to help the cross stand out. This miniature shield can be used as a sword plaque / sword hanger. This Black Prince Mini Shield is a miniature wooden shield and features the coat of arms of Edward of Woodstock, better known as Edward, the Black Prince. This miniature shield can be used as a sword plaque / sword hanger. Salute your next voyage with this elegant set of 2 sailor's cups. Made of spun brass and plated in silver, they’re safe for your next rum toast! Brazed onto each cup is a copper anchor for added nautical flare. Our Decorative Damascus Steel Archers Bow is hand forged from steel and makes a unique display. Overall is 41in long. How do you make Mini Damascus items? On a Mini Damascus Anvil! Makes a Unique Gift and completes your Collection of miniatures. Our Damascene Boabdil Letter Opener by Marto is manufactured in Toledo Spain by the famous Midas factory of the Marto swordsmiths. Our Damascene Carlos V Letter Opener by Marto is manufactured in Toledo Spain by the famous Midas factory of the Marto swordsmiths. Our Damascene Excalibur Letter Opener by Marto is manufactured in Toledo Spain by the famous Midas factory of the Marto swordsmiths. Our Damascene Medieval Templar Knight Letter Opener by Marto is manufactured in Toledo Spain by the famous Midas factory of the Marto swordsmiths. Our Damascene Tizona Cid Letter Opener by Marto is manufactured in Toledo Spain by the famous Midas factory of the Marto swordsmiths. Our Crusader Medieval Letter Opener by Marto is that of those religiously sanctioned military campaigns waged by much of Christian Europe. Our Don Quixote Letter Opener by Marto celebrates all of his adventures which gained his fame. Our El Cid Campeador Tizona Letter Opener by Marto is a replica of a sword that belonged to the Castilian knight Rodrigo Diaz de Vivar, known as "El Cid Campeador" in the 11th century. Our Excalibur Letter Opener by Marto honors King Arthur, ;the legendary British leader. Our Emperor Charlemagne Letter Opener by Marto honors Charles the Great, King of Franks, and Emperor of Western Europe. Our Folding Oculator Encompassor Binoculars is by far the most unique steampunk device we have ever offered! This little ditty could have sat on the desk of Jules Verne himself. This all brass, fully machined piece unfolds and transforms to create a small pair of portable binoculars. This El Cid Mini Shield is an impressive little shield features a quartered field of red and white. On the field quarters sits a heraldic lion, while the red field holds a castle with three towers. This miniature shield can be used as a sword plaque / sword hanger. Our Damascene Medieval Templar Knight Letter Opener by Marto is manufactured in Toledo Spain by the famous Midas factory of the Marto swordsmiths. The Damascene Templar Letter Opener is plated with 24 Karat yellow gold and 18 Karat green gold with a minimum thickness of 4 microns. Add some flair to your kitchen decor with this Dragon Bottle Holder. Made from cold cast resin with hand painted details, measures approximately 11 inches long. Made from cold cast resin with hand painted details, this Dragon Egg measures approximately 3.5 x 2.5 x 3 inches. Shown emerging from its egg, this tiny dragon looks around for the first time. Makes a great addition to your dragon or fantasy collection. Made from cold cast resin with hand painted details, this Dragon Skull Trophy measures approximately 10.5 x 10.25 x 10.75 inches. Made to hang on your wall, this trophy makes an impressive addition to your dragon or fantasy decor. Shed a little light on your collections with this Dragon Table Lamp. Measuring approximately 5 7/8" x 4 1/2" x 16 3/8", the lamp base is made from cold cast resin. Add some flair to your bathroom decor with this Dragon Toilet Paper Holder. Made from cold cast resin with hand painted details, Measures 12 5/8 x 3 7/8 x 10 1/8 inches. Curled up and cozy inside of its egg, this Dragon Hatchling doesn't seem quite ready to emerge. Made from cold cast resin and hand painted, this beautifully detailed sculpture measures 4.75 inches tall. Makes a great addition to your dragon or fantasy collection. Made from cold cast resin with a hand painted faux stone finish, this Dragon Clock measures 9.5 inches tall. Perfect for a desk or dresser, this clock makes a unique addition to your fantasy collection. Made from cold cast resin with a hand painted faux stone finish, this Dragon Candle Holder measures 6.75 inches tall. Perched atop a castle, this dragon happily basks in the warm glow of a tea light (not included). Made from cold cast resin with a hand painted faux stone finish, this Dragon Candelabra measures 8.75 x 4.25 x 12 inches. Make a dramatic statement at your dining table, or walking through long, dark halls. Holds 3 taper candles, not included. Measuring 5.5 x 4.5 x 6.75 inches, this Dragon Storm Ball makes a hypnotizing conversation piece. The cold cast resin dragon head holds a glass ball in its mouth, filled with colored sand. When activated, a sand storm show begins! 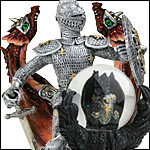 Made from cold cast resin with hand painted details, this Dragon and Armor Statue measures 8.75 x 8.75 x 15.25 inches. Made from cold cast resin with hand painted details, this Dragon Parent and Young Statue measures 7 x 5 x 5.25 inches. Perfect for the mother, father, or other caregiver in your life. Made from cold cast resin with a hand painted faux stone finish, this Dragon Lamp measures 11 5/8" x 11 5/8" x 20 1/8". This AC powered dragon makes a great accent lamp or night light. Switch provided on cord.